Cousins Coleman and Dinah Greene moved to New York City after college to make their mark on the art world, and they have—Coleman as the editor of an influential arts magazine, and Dinah as the owner of a print gallery in Greenwich Village. But challenges mount as Coleman discovers a staff writer selling story ideas to a competitor, while Dinah’s Greene Gallery slips into the red. When billionaire Heyward Bain arrives announcing plans to fund a fine print museum, Coleman is intrigued and plans to publish an article about him, and Dinah hopes to sell him prints. Then, unexpectedly, swindlers invade the art world to grab some of Bain’s money, and a print dealer dies under mysterious circumstances. Risking her own life, Coleman sets out to unravel the last deception threatening her, her friends, and the once-tranquil world of fine art prints. Reba White Williams explores the New York art scene with all the suspense of a well-written murder mystery. 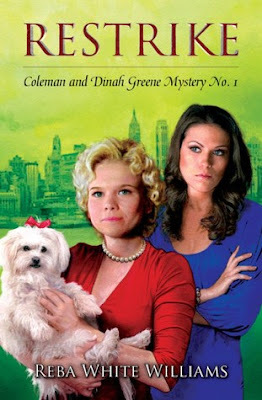 Restrike invites readers into the lives of the Greene cousins: Coleman and Dinah. Coleman is a journalist and owner of the ArtSmart magazine. She has a curious mind that really spurs the story's pace. Her cousin Dinah is married to investment banker, Jonathan Hathaway, and the owner of a print gallery. With both girls knee-deep in the art world, it's inevitable that the mysterious murder of a virtually unknown print dealer would attract their attention and have them searching until answers are found. Restrike is a murder mystery that goes beyond suspense and thrill. Jimmy La Grange's death is the starting point of a chain reaction of events that may take readers by surprise, but will definitely intrigue. The connections between characters becomes a tangled web, deceit, betrayal, jealousy and secrets included. The story was a little slow going in the opening chapters, but once I acclimated to the terminology and really understood what was so significant about Jimmy's death, I felt the excitement start to bubble up. I wanted this crime solved just as much as Coleman and Dinah, even when it wasn't believed to be art related. Williams's writing style is notable, as well. Restrike is written in third person with multiple perspectives. While Coleman and Dinah are our driven heroines, readers get to know their friends and enemies, too. There's a well rounded variety of characters, some you'll love and others you'll love to hate. I think it shows real talent that while presenting the perspective of many characters, even those under suspicion, Williams was able to keep the truth hidden from readers. While the ending wasn't outrageously shocking, I never would have guessed exactly 'whodunit'. I am absolutely clueless about art, I didn't even know how wide the range of the art world extended. Williams made quite an impression on me in that regard, because Restrike not only takes readers deep into Coleman and Dinah's lives, but pretty much paints a perfect picture of what goes on in that world. I can say with absolute certainty that even if art isn't your forte, Restrike will be a very appealing read!